ITUC and ETUC issued an open letter to delegates at the 10th ILO European Regional Meeting; International trade union movement declares its absence in Istanbul meeting. DİSK’s Statement on 10th European Regional Meeting of ILO. 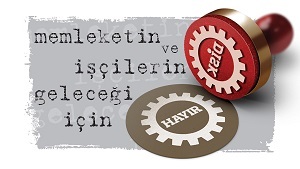 Hundreds of thousands of workers have marked International Workers Day with rallies organized by labour centers, DİSK, KESK, TMMOB and TTB. A joint ITUC and ETUC delegation visited Ankara on 12 and 13 October 2016.